Course Duration Totally flexible - no completion dates. Contact required periodically to maintain an active course. 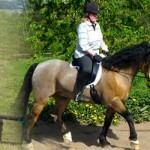 Are you a new owner and aim to improve your riding ? Could you improve your horse’s way of going or in a dressage test? Would you like to train your own horse? Think you’re not good enough or lack ideas on how? Do you get bored / need new ideas when in the arena? If you answered ‘YES‘ help is right here. Let’s face it whether we are new owners or experienced riders, we could all do with a bit of help now and again – and that applies to both you and your horse. There is always something new to learn. If you are determined to learn, no one can stop you ! You don’t need to have an expensive flashy horse to do well – click this internet link to see the Mule called Wallace. 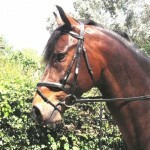 Wallace was in the equestrian press in 2018 having won the first dressage class he ever entered. is included in this course – it’s free. Our well qualified and experienced senior coach – Senara Caddy is here to help improve your techniques on horse training on a one to one basis. Coaches and instructors we talked to reported that: Amongst the riders they meet, detailed knowledge of things like the hidden aids is often very limited. It seems that some coaches just do not cover this type of aid in sufficient depth – if at all. Most top competitors do not publicly discuss their hidden aids although many well understand their importance. Now’s your chance to learn. Senara, your tutor for this course, is a professionally qualified BHS Senior Coach who has worked at top levels both here overseas. Here in the UK she trains riders to competition standard and has also worked with top competition horses in Belgium. Further afield again Senara has worked as Senior Development Coach and Trainer for the New Zealand Equestrian authorities and organisations – a position which does not come lightly and requires a professional and experienced trainer. Few people have such an opportunity to work with this sort of trainer – don’t let it slide past you. You’d like to improve your horse. You have little opportunity to have regular lessons. You need ideas to give structure to your schooling and training. You get bored when in the school/arena. You are an experienced rider & want to keep up to date with new and interesting exercises and ideas. You have an older but unschooled horse. You want to re-school or re-train your horse. You are keen to have a go at dressage at a local competition. You have no option but to ride in the arena/school. You are keen to learn more about riding and training. What’s in it for you and your horse? You may save the course files on a memory stick or in a cloud folder if you want to access them on your phone at the stables on another device or at work etc. A 20 Minute Schooling session plan – Ideal for when you have limited time. You could record yourself reading through it & play in your ear whilst riding. Never get stuck for what to do next. Modern research has shown that many horses are suffering from pain and yet few riders have been given a clear understanding of how a horse might show pain. The tool in this course will help you work out if your horse could be suffering from any stiffness or pain. If I always do what I’ve always done, I’ll always get what I always got. If you don’t change the way you do things, everything will simply stay the same. Only if you make things different can you change the way things happen. That is what training your horse is about – making tiny changes, some so small that no one can see. Here on this course you will find your friendly one to one tutor support to help you make any tiny changes that will help you succeed. We have also provided you with a variety of Tools and School Exercises for Training Horses that everyone can use to prevent you and your horse getting bored in the school and more importantly to help tone and improve you both. What is expected of me as I work on the course? It is well known that the best way to learn and remember any subject or topic is to write things down in your own words. To benefit from this particular course about training a ridden horse, it stands to reason that you need to practice what you are reading. Practice each new movement or exercise you are being given more than once – practice until you feel you have improved. Even those movements or exercises you are familiar with and which seem quite basic can be improved, so take time to do the simple things as well as the new more challenging ones. Practice in bite sized chunks. Always end on a good note when riding. This is really important for both of you, even if you have not yet mastered the new exercise or movement. If it seems to be going wrong or not working, just a stride or two of what you are aiming for is good enough at the end. If that seems to be beyond you both at the moment, change to working on something you know that you and your horse do well and finish your session with that. Now reward your horse as well as yourself. If it didn’t work today you can try again tomorrow – as long as you finished today on a good note. If the last thing your horse remembers and ‘associates with’ when leaving the schooling area is a bad feeling from you, he or she is unlikely to be keen to repeat the exercise. If you are not quite sure about equine psychology relating to ‘association’, the Lingfield Level 1 course material will explain it to you. Never move on to the next exercise or topic in your course material until you have mastered the last one. Contact Senara if you are struggling to complete any movement or exercise – ask her for help and advice. NOTE: The link you will receive to after enrolment enables you to download the first file. That link is time limited – it runs out in just a few days. It is also download restricted – you can only click to download a few times – therefore, you MUST be able save the file. How to work through the course: Basically you are expected to record anything new you are learning on each topic. Some jot things down in a notebook or on a digital notebook and transfer it in more detail onto a typed Word style document. This is probably the most common route to recording your own notes when doing a course, and is the most common way of learning for students of any age. You will be expected to complete and record the Research / Practical Activities on MS Word compatible documents. You are encouraged to achieve a certificate on completion of this course. The final assessment paper will be a mixture of questions, mainly taken from the course text, requiring short answers, plus a few requiring longer answers. To get the best from the course you must save the files to a device, and should work progressively through the course material, make your own notes and undertake research and the practical activities as you do so. If you decide on completion to aim for the optional certificate, send in your final assessment paper. If any answer is thought to be borderline, Senara will provide friendly feedback and may request sight of your Research / Practical Activities to establish your depth of knowledge. READ MORE – Read on for full details before enrolling. The syllabus for this course is considered by many coaches to be more comprehensive and detailed than most others at this standard and fee. It explains in easy to read language what all these terms are and what they mean to you in every day riding terms. Aids – and hidden messages the professionals use. Muscle Memory – what it is & how to improve it. Stretching down – ground exercises.